2 Day Workshop held on 2 Sundays: April 15th and 22nd, from 9:00 am to 5:00 pm. It is highly recommended to attend both days, but it is possible to attend just one of the days. Sunday, April 15th, is beginner to intermediate level. Sunday, April 22nd, is intermediate to advanced level. Vignette exercises to implement trans inclusive and affirming therapy, counseling and practices. Introduction to Trans identities, historical context, and relating participant experiences. Deconstructing gendered messages, building deeper awareness around trans and non-binary identities and experiences. Further deconstruction and understanding of gender binaries, active ally practices and tools. Identifying active ally behavior within the context of therapeutic work. Vignette Practice. Kyle is the founder of Building Allies. He is a long time trans activist and spends much of his time connecting his passions to social justice and challenging privilege. Kyle has developed and facilitated many lectures and workshops regarding trans identity to help educate individuals, organizations, and service providers in the development of their own active ally behavior. This workshop costs $400 for both days or $250 for just one of the days. There is a 20% discount when purchasing multiple registrations for a group, organization, or community. 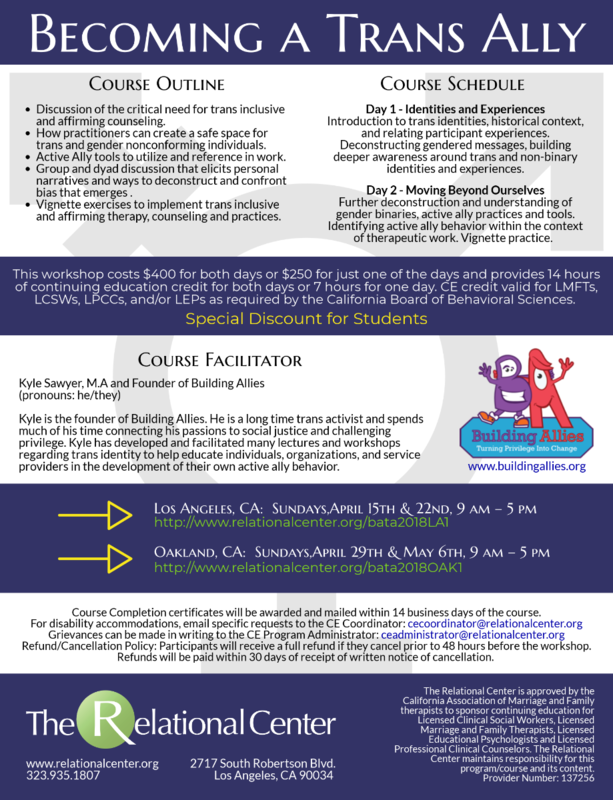 The full course meets qualifications for 14 hours (7 per day) of continuing education credit for LMFTs, LCSWs, LPCCs, and/or LEPs as required by the California Board of Behavioral Sciences. 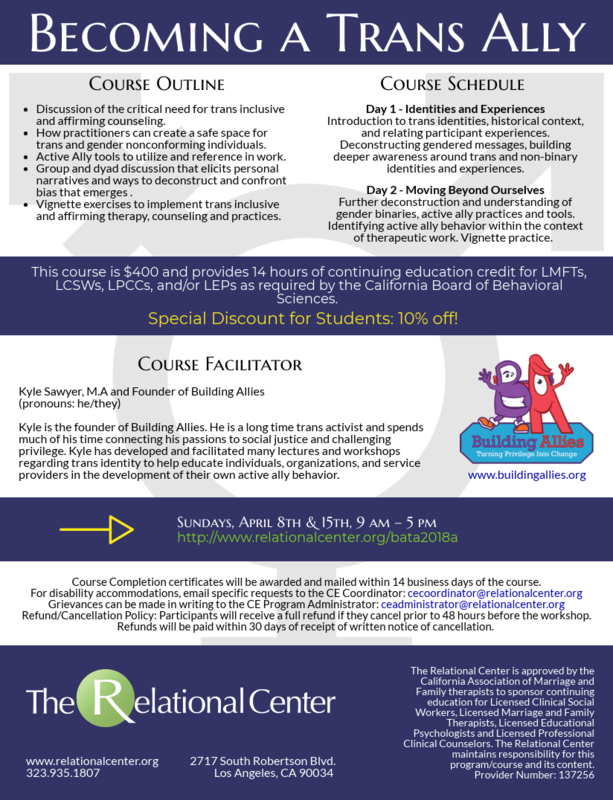 This course is intended for LMFTs, LCSWs, LPCCs, and LEPs. Refund/Cancellation Policy: Participants will receive a full refund if they cancel prior to 48 hours before designated workshop. Refunds will be paid within 30 days of receipt of written notice of cancellation. Course completion certificates will be awarded and mailed within 14 business days. For disability accommodations, please email specific requests to cecoordinator@relationalcenter.org. Grievances can be made in writing to the CE Program Coordinator (cecoordinator@relationalcenter.org).